Twenty years ago we lived in the house of our dreams on a semi rural hilltop surrounded by cherry orchards. We all looked forward to Melbourne Cup Day, the first Tuesday in November, which marked the beginning of the local cherry pick, not only for the feverish activity it brought to out peaceful idyll but also for the delicious fruit that was regularly left on our doorstep. The pickers were generally a ragtag mob of backpackers who pitched their tents by the sorting shed on our fence line, but there was never a worry about late night rowdy parties, exhaustion from working up a ladder in the hot sun took care of that. Each year they were supervised by the same Canadian guy who would arrive a month ahead to plant a veggie garden to keep himself, the pickers and the neighbours supplied with fresh salad veggies over the summer period. In their early teens our daughters joined the pickers, their first paid work. They were willing workers, and were readily re-employed each season. The pay was much more generous than pocket money. Cherries have played a big role in or lives. I love the big fat juicy late fruiting Bing variety for eating and think them too good for cooking. It’s the variety I choose to take pride of place with our Christmas desserts. Smaller, softer cherries often have stronger maraschino overtones making them perfect for jam, tarts, pies and clafoutis. A recipe from Simon Bryant’s “Vegies” inspired me to pickle a jar of small non descript cherries to serve with baked brie. This was a test batch so I limited it to only 500g of fruit, but the slightly sweet, slightly sour flavour was so complementary to the rich warm cheese, I’ll be making a larger batch in the next day or two. The hardest part of this recipe is waiting the 7 days for the cherries to pickle. Wash a large jar and it’s lid in hot soapy water. Place in an oven heated to 120C for 30 minutes. While the jar is sterilising, wash the cherries. Using a toothpick, pierce each fruit with a toothpick down to the stone in 2-3 places. Put the sugar, vinegar and water into a small pot and gently warm, stirring continuously until the sugar is dissolved. 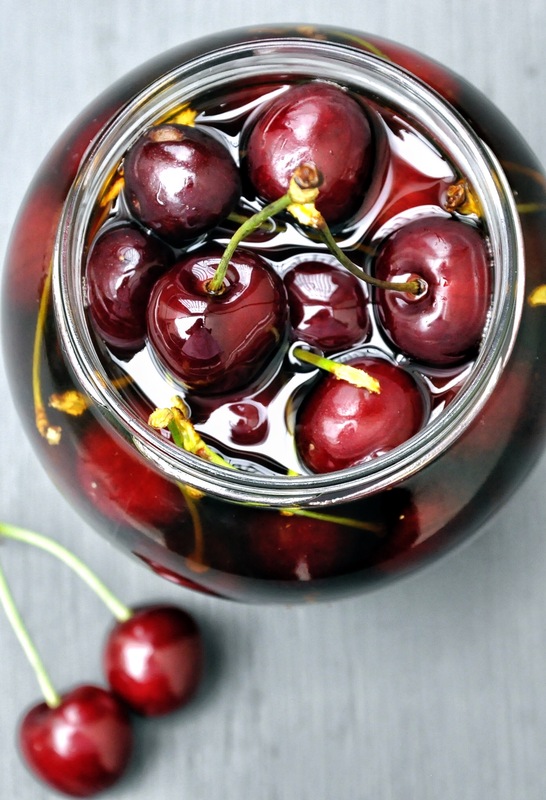 Pack the cherries into the jar, then pour the pickling liquid over the cherries ensuring they are well submerged. Seal with the lid, then refrigerate for 7 days* before serving with warm oozy brie, Christmas ham, roasted duck or lamb. *Update: After 10 weeks, the maraschino flavours from the pits had permeated the cherries. They are much better after a longer time than I originally recommended in the pickling liquid. I love pickled cherries. They go great with charcuterie, as well as warm Brie. I want to use them in a sauce for venison, perhaps duck. I do my pickled cherries differently so I need to give these a try. I just bought 8 lbs of cherries to pickle so the timing of your post was perfect. Nice to see you in blogland Richard. This was a great starting point, we loved the result. They would be absolutely delicious with game. I’d be curious to see your recipe, have you posted it? Both were very tasty but I preferred the bing cherries. The vinegar at the end is wonderful and I am thinking of marinating some pears in it for a dessert or a salad. 🙂 It’s just too good to throw away. I have a recollection of having seen this post but at the time omitted to save it. It would be interesting to see how the texture of the cherries differs after simmering them in the pickling liquor versus pickling them raw. The bing variety have just begun to appear, I’ll make a batch to your recipe and report back. Your bio notes ar as interesting as your recipes, Sandra. Life has been varied that for sure! Wow, your recipe, your photos are just gorgeous. I also love the big fat juicy late fruiting Bing variety… I eat them immediately if I get my hands on them. For some reason, I always forget that you are in an opposite season than us, and the first thing I thought was, where did she get these gorgeous cherries from. 😀 ))) Wonders of the universe. One of the (many) things I love about cherries is that they are seasonal, so it is a joy to see them in the fruit shop and know that their deliciousness will only be around for a few months. I pickled cherries for presents last year. But I gave all the bottles away and never tried them! So I will make them again, using your recipe. I have never heard of champagne vinegar. Where would I go in Melbourne to find some? I buy champagne vinegar at the Vital Ingredient at Prahran Mkt. It’s a bit more expensive than white wine vinegar, but has a very gentle acidity. White wine vinegar was the vinegar stipulated in the original recipe. Thank you. I rarely get to the Prahran Market, but I will keep my eyes peeled at other places. I’ll be definitely trying his recipe. Any substitutions you might recommend for the Champagne vinegar? I have a pantry full of vinegar and really shouldn’t add another bottle. Great stories of the old Wandin days.Such a lovely place. Actually Francesca, Bryant’s recipe asks for white wine vinegar, but all I had was champagne! Huh…that sounds kinda decadent…. I have to wait too long for cherry season! These look excellent. I’ve pickled the tiny wild plums in my backyard with good success and will have to try cherries. That combination of sweet and tart is a winner. Thanks you Liz, I was very happy. I don’t have much of a sweet tooth so I love an acidic tang. If you liked the pickled plums, you’ll enjoy pickled cherries too. Your title alone had me hooked – anything pickled, anything cherry. And, what a wonderful trip down memory lane! I’m definitely bookmarking this one for when cherries are in season here. Thanks Deb. Posts inspired by wandering down memory lane seem so much easier to write. Believe me these cherries will be worth the wait, they are excellent! Oh my. These sound fabulous. How are you serving the cherries with the brie? I thought of you Mimi when I served the cherries and warm cheese! Because this was a trial batch and the recipe instructed me to leave the stems and pips intact, I just served them beside the oven warmed brie, but they were so delicious together I think next time they could be piled on top before the cheese goes in the oven. Lovely post – right up my street 🙂 And fantastic cherry images too! Thanks Katherine. I’m a city dweller now, my garden comprises a few pots of herbs on a balcony and a potted cumquat tree, but i love variety in my diet and taking advantage of seasonal fruit and veg to pickle and preserve. What a great story and memory. Fat juicy cherries, oh my. One of my NZ grandfathers was an orchardist and I have gorgeous memories of cherries, especially those cherry guns going off! I am sooooo making a jar of these for Chrissy day, the growers market have just started getting cherry stock the last few weeks. 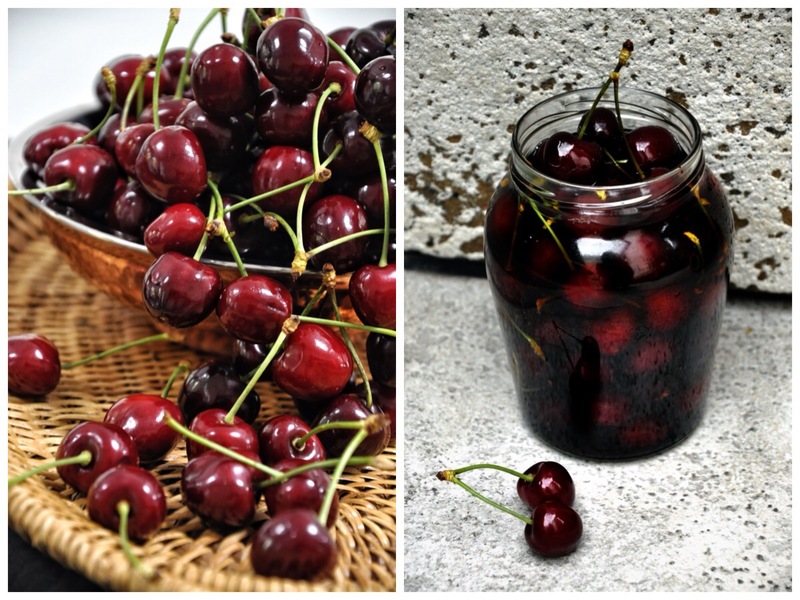 This entry was posted on November 24, 2014 by ladyredspecs in FODMAP diet, Food, Gluten Free, Pantry Essentials, Pickles & Chutneys, Preserves, Sauces, Side Dishes & Salads and tagged cherries, pickle, pickled cherries.